There’s nothing quite like seeing bloggers being recognised by brands like essence cosmetics, brands seeing the value in collaborating with influencers, and providing them with the opportunity to create something really special. I can only hope that one day I’ll be able to create a palette (or any other makeup product) that has my personal stamp of approval on it. Oh, the fun I’ll have! Anyway, so essence recently collaborated with 4 international bloggers, and each blogger was given the opportunity to create a makeup palette and nail polish. I’ll be honest: There was only 1 palette in the collection that really stood out to me, the other 3 palettes are nice but they didn’t excite me. Don’t get me wrong, the packaging of ALL the palettes is absolutely stunning – bright colours & creative designs, but it’s what’s inside that counts, right? So, I picked up the essence ‘The Glow Must Go On’ palette. 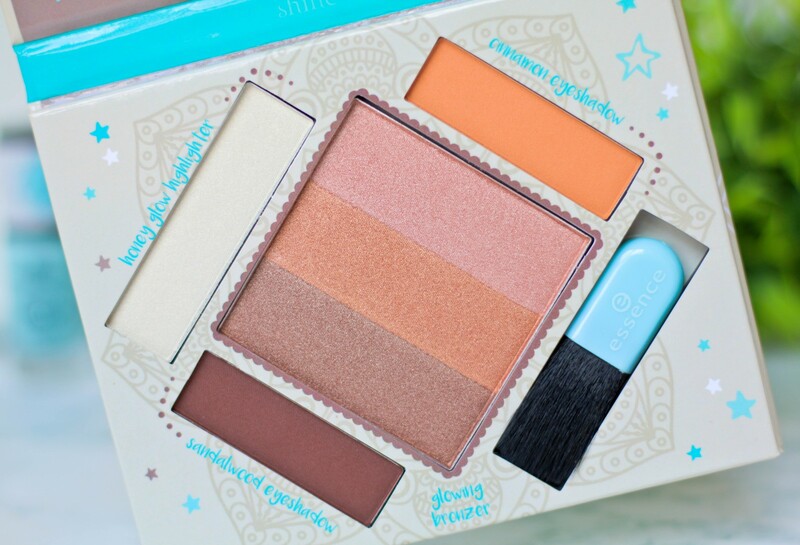 ‘The Glow Must Go On’ palette was created in collaboration with Serena from Beautylab.nl (she’s based in the Netherlands) – I must admit, I hadn’t heard of her blog before this collab but was very happy to have discovered it, because her photos are amazing! Granted, I don’t understand a word of her YouTube videos (or blog posts for that matter) but I enjoy looking at her photos. ‘The Glow Must Go On’ bronzing & highlighting palette is definitely more than just a palette to add a bronzed glow to the skin, it also contains 2 beautiful eyeshadows – so technically speaking you can create an eye- and cheek makeup look using just this palette. I’m sure you already know I love multi-functional products, and there’s absolutely nothing stopping you from using the bronzer or highlighter shades as eyeshadows too! Keep reading ’till the very end, because I created a makeup look using the palette. I bought the essence ‘The Glow Must Go On’ palette and the accompanying nail polish called ‘Shine Bright’ at Dis-Chem last week. I have a feeling these are going to fly off the shelves, so if you see something you like, then I suggest you pop in to your nearest store as soon as possible. 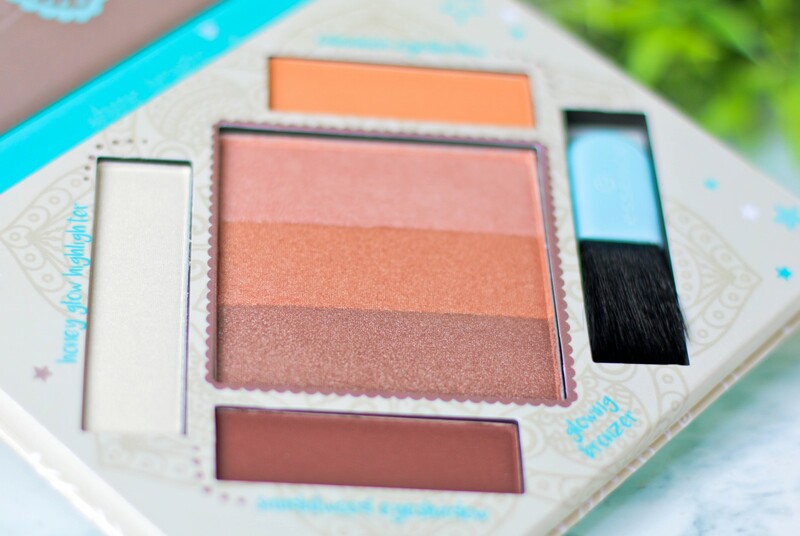 First, let’s take a look at the palette: I’m really impressed with the design of the palette – I love the duck egg blue hues (so fresh & clean), plus the moroccan-inspired design is beautiful too! Not only will the shades in this palette help you add warmth and a bronzed glow to the skin, but the eyeshadows and highlighter shades can be used to create a natural or dramatic eye makeup look. The essence ‘The Glow Must Go On’ palette features 3 warm-toned bronzer shades, 2 eyeshadow shades, and a frosty highlighter shade. 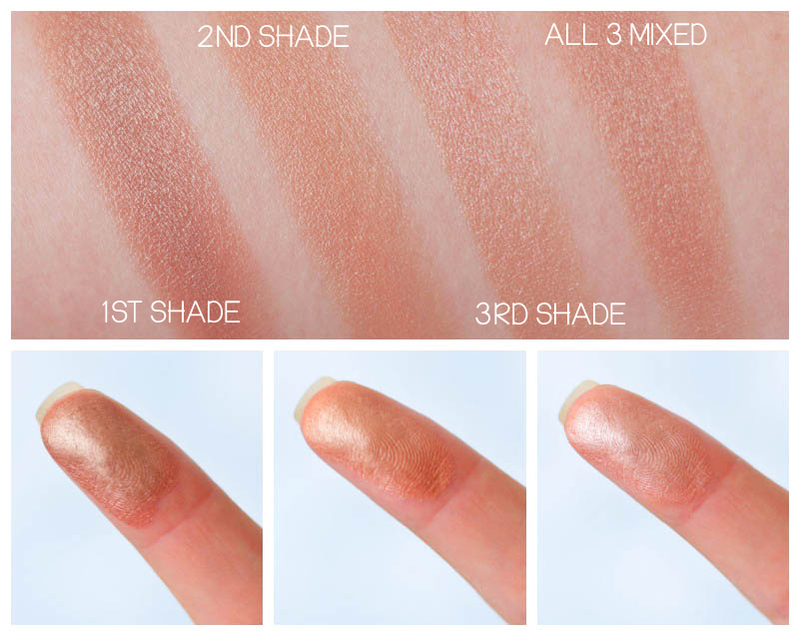 Here are the 3 individual glowy bronzer shades ranging from a lighter rose gold shade, to a shimmery bronze. The shades can be mixed together (just swirl your makeup brush around the entire block) to achieve a mid-tone bronzer shade, or you can focus on specific shades within the bronzer block. For the below makeup look I mixed all 3 shades together. These bronzers are all quite shimmery (they don’t have a matte base with a sprinkle of shimmer, they are proper illuminating bronzers), so I suggest you start out with a fluffy brush and use a light hand. The shades have decent pigmentation, and are all very buildable but it’s easy to go a bit overboard and end up with a metallic sheen on your cheeks & forehead (depending where you usually apply your bronzer). A part of me wishes the middle shade was matte, just to tone down the foiled factor of these bronzer shades but I do like the effect they give the skin nonetheless. All 3 shades feel super soft to the touch (the darkest shade feels very buttery) and I haven’t had any issues with fallout or product kick-up. I have quite fair skin (I’m usually a MAC NW15 or NW20 foundation) and I found all 3 shades worked perfectly with my cool-toned skin. I imagine the shades will look even more gorgeous on medium to tan skin with an olive undertone. As mentioned earlier, the bronzer shades can also be used as eyeshadows (they look stunning on the eyes) and I find when used with an eyeshadow primer as a base, they last really well on the lids. Next up are the eyeshadow shades and the powder highlighter. The palette features 2 matte eyeshadows called ‘Cinnamon’ and ‘Sandalwood’ – I imagine the names were inspired by the spice markets you see in Morocco. ‘Cinnamon’ is a beautiful burnt orange shade (almost like a mix between Makeupgeek ‘Creme Brulee’ and ‘Chickadee’ eyeshadows), it really is the perfect transition shade for the crease of the eye. ‘Sandalwood’ is a rich, chocolate brown shade with a very subtle burgundy undertone (almost like MAC ‘Swiss Chocolate’ and ‘Sketch’ had a baby). Surprisingly, these eyeshadows apply much better than they swatch – it just goes to show, sometimes eyeshadows perform better when used with a brush. I didn’t have any problems with the pigmentation of the eyeshadows (sometimes essence shadows can be hit & miss) and I was so happy to see these blend really well too. The eyeshadows hold their own incredibly well – what I mean by this, is that the shades don’t blend into one another creating a muddy mess. 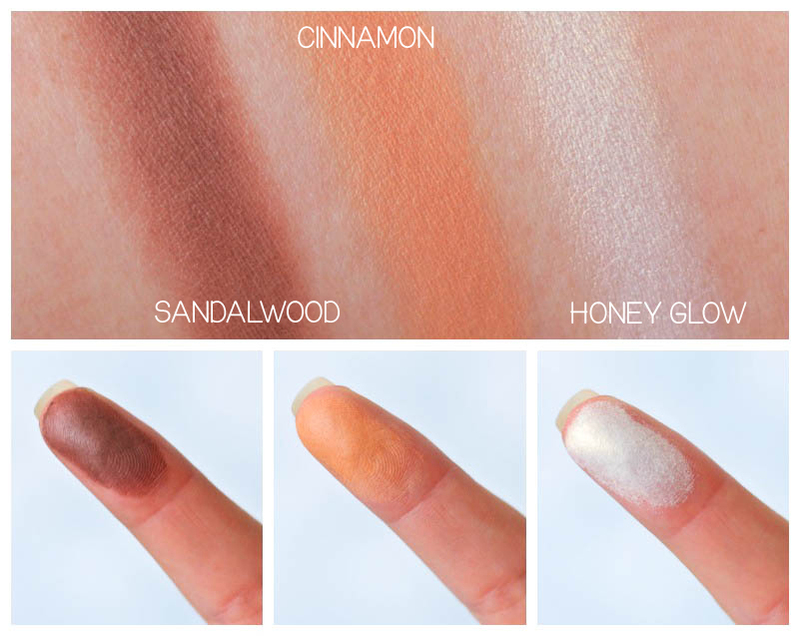 Even when these are applied and blended on top of one another, you can still see the ‘Cinnamon’ shade and the ‘Sandalwood’ shade as individual eyeshadows – yet they blend beautifully for a seamless eyeshadow look. Hopefully that makes sense!? The ‘Honey Glow’ highlighter surprised me…a lot! It is super pigmented, and gives a golden glow to the cheeks – it reminds me of MAC ‘Vanilla’ pigment mixed with MAC ‘Oh Darling’ highlighter. The finish of ‘Honey Glow’ is very reflective, and it’s one of those highlighters that will give you that intense Instagram duochrome illuminated look. For the above makeup look, I used a mixture of all 3 bronzer shades to warm up the perimeters of my face and applied the ‘Honey Glow’ highlighter to the tops of my cheekbones and tip of the nose using this brush. I decided it was a little bit too yellow-toned for my complexion, so I added a tiny bit of the rose gold bronzer shade on top of those areas to tone down the warmth of that golden illuminator. In terms of the eye makeup look, I started out with the ‘Cinnamon’ eyeshadow as a transition shade in the crease. I wanted a really blown-out eye look, so I blended it upwards towards my brow bone. I applied ‘Sandalwood’ to my lower crease area using a smaller blending brush, and then popped the rose gold bronzer shade onto my lid. I highlighted my brow bone and inner corner with the ‘Honey Glow’ shade, and then finished the eye makeup look off with Sandalwood as an eyeliner (I spritzed a little bit of makeup setting spray onto an angled liner brush and dipped it into the eyeshadow). For the lower lash line, I applied a little bit of ‘Cinnamon’ with a pencil brush and then intensified my lower lash line with ‘Sandalwood’ on a dry angled liner brush. 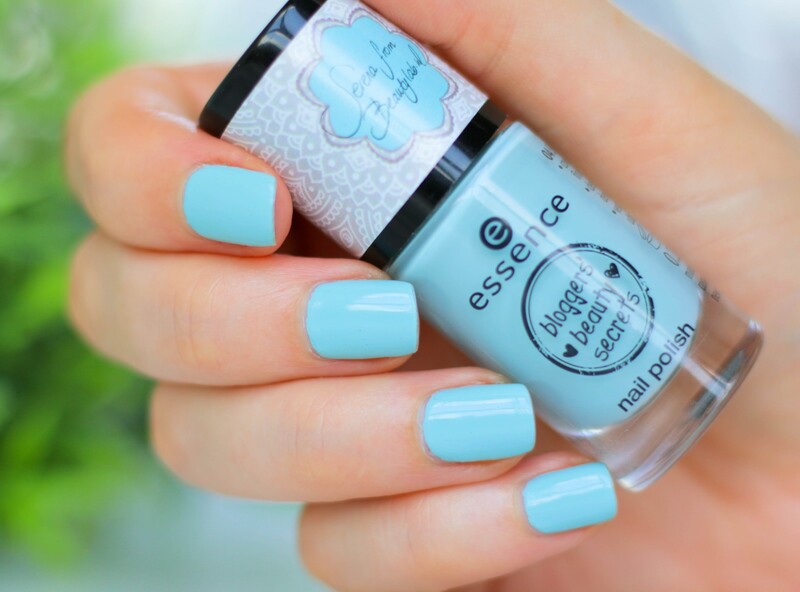 The essence ‘Shine Bright’ nail polish is a beautiful duck egg shade, and contains no shimmer. Formula-wise it was quick & easy to apply (not streaky at all) but I did notice some tiny bubbles on some of my fingers after I applied the second coat. All you need is 2 thin coats for this shade to be fully opaque, top it off with a fast-drying top coat and you’ll be good to go! In terms of lasting power, this specific shade started chipping after 2 days unfortunately. Do you need it in your life? Probably not…and if I had to choose between the palette and the nail polish, I would choose the palette 100 times over! 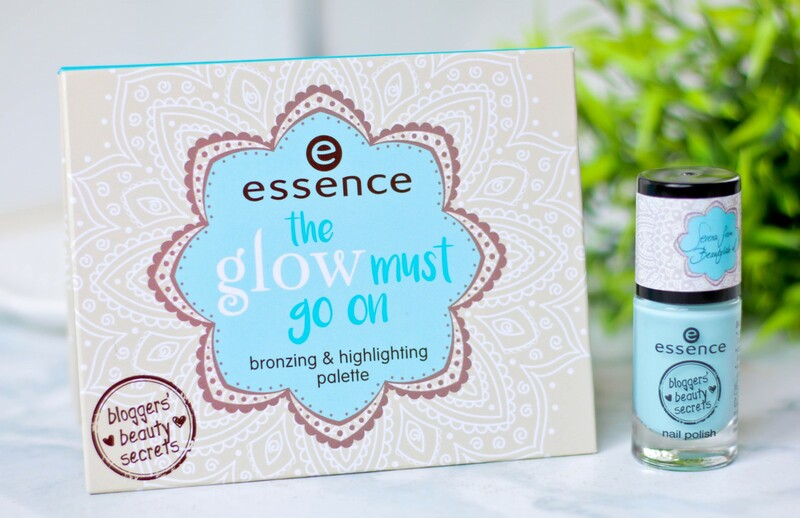 The essence ‘The Glow Must Go On’ palette retails for R104,95 (I paid R94,95 at my Dis-Chem though) and the ‘Shine Bright’ nail polish retails for R34,95 at Dis-Chem stores nationwide. 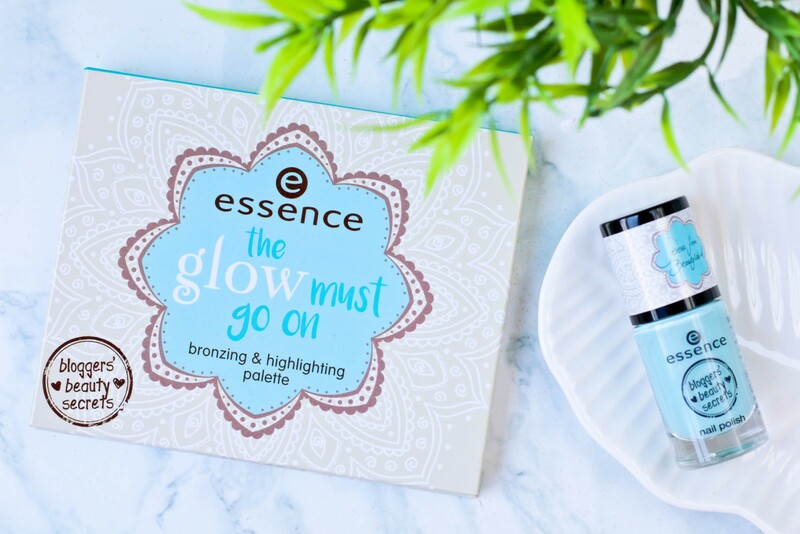 All in all, I think the essence ‘The Glow Must Go On Palette’ will be a great addition to any makeup collection – it gets 2 thumbs up from me! I was super impressed with the pigmentation, blendability and lasting power of the eyeshadows, highlighter and bronzers in the palette. Serena did a great job with the palette, especially since it performs even better than some of my high-end palettes. As mentioned, I just wish the middle bronzer shade (1 of the 3 bronzers) was a matte shade. Other than that, this is a great little palette for the price point! That’s it from me for today, I’m off to go get ready for my dinner date tonight. Neal is taking me out to dinner for my birthday, and I want to dress up because we’re apparently going to a really nice restaurant. My birthday is only tomorrow (the 8th of February) but the restaurant unfortunately couldn’t accommodate us tomorrow night, so we’re celebrating tonight! I’ll have a glass of bubbly (or two)…geez, I can’t believe I’m turning 34! P.S. I’m busy uploading a makeup tutorial video (featuring my ‘Best Of Beauty 2016’ makeup products) as I’m writing this blog post, so be sure to check back in on the blog tomorrow morning! Or you can subscribe to my YouTube channel here. Happy Happy Birthday for tomorrow Luzanne. Thank you for this informative blog post and the stunning swatches. I was contemplating purchasing this palette but I wasn’t too sure about the quality. I’m definitely going to look for it now. Happiest of birthdays to you for tomorrow!! P.S: you look soooo pretty in these pix. Love the look you created! Am living for this eye look Luzanne! It’s gorgeous! I haven’t spotted these palettes in PE yet, but I’ve only checked at a small clicks in my neighbourhood. I’ll try one of the malls soon. I want to get one for my daughter…lol. She loves playing with makeup…but just in the house of course. Thanks for the in depth review. Can’t wait to see the video tomorrow! For some reason my surname isn’t here and I’m thinking…who is this chick with my name…then I realised it is my comment. lol. I agree – the packaging of the entire collection was so beautiful! Love all the bright & girly colours! 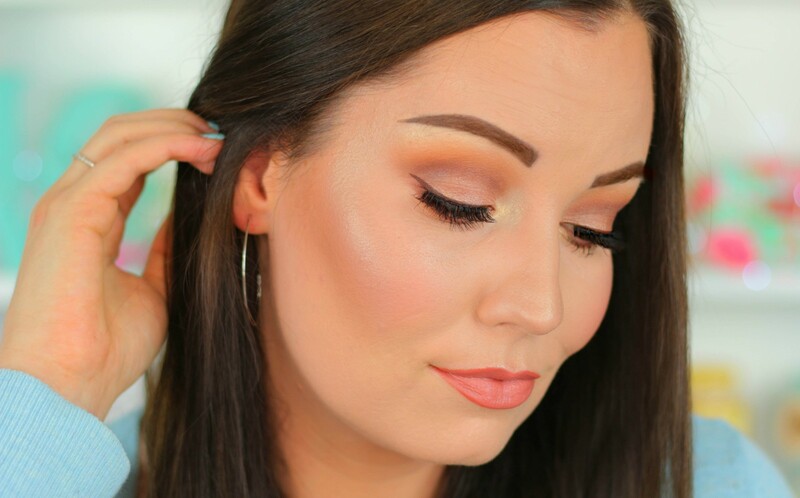 OMG looks like I’ll have to get this palette, the makeup look you created is absolutely gorgeous Luzanne! Can’t wait to see your YouTube video. Hope you have a fabulous time tonight and a wonderful birthday tomorrow and year ahead. Thanks for the beautiful blog post as always. Happy Birthday, May you be blessed always. HAPPY BIRTHDAY BEAUTIFUL!! May your day be happy and your year blessed! Loved this informative post. I am definately getting my hands on the palette. Loved your make up look you created. Really helps when you know what to do with a palette as I often don’t use the full palette but your look shows how to incorporate everything. 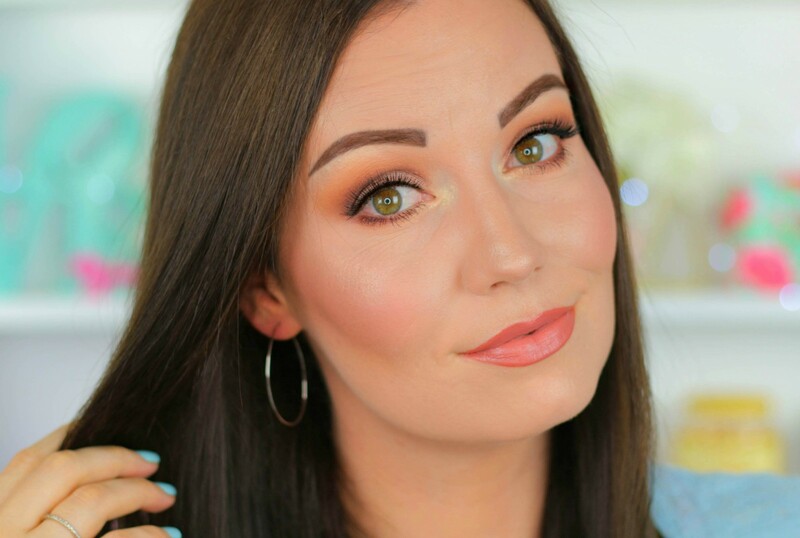 I am going to try do these makeup looks as part of reviews going forward – I think it’s so helpful when you can see exactly what the products look like on the face / skin. Thank you for this informative post. I loved the make up look you created using all elements of the palette. I often buy palettes but seldom everything. This palette is a definite purchase seeing as I would be able to maximise usage. #BESTBLOGGER!!! Happy B-day, Luzanne! May you be blessed with many, many more days like today! Exactly! BEST Blogger on all items regarding make-up! Trust you had an Amazing Birthday Beautiful! Stunning Palette! Stunning reviews as always! You always make everyone want to rush out and buy these magnificent products you review/video. I think this palette will look fab on my dark skin tone as a highlighter, what do you think?